A collection of applets which focus attention on different ways in which Numbers can be formatted. Inspired by Stephen Yorgey's 'necklace' numbers, and Stephen von Worley's animated sequence of these, I constructed an applet that gives individual control over the number being formatted and the order in which the primes are used. Notes are included with the applets. ​Different orders of prime factors gives different diagrams. 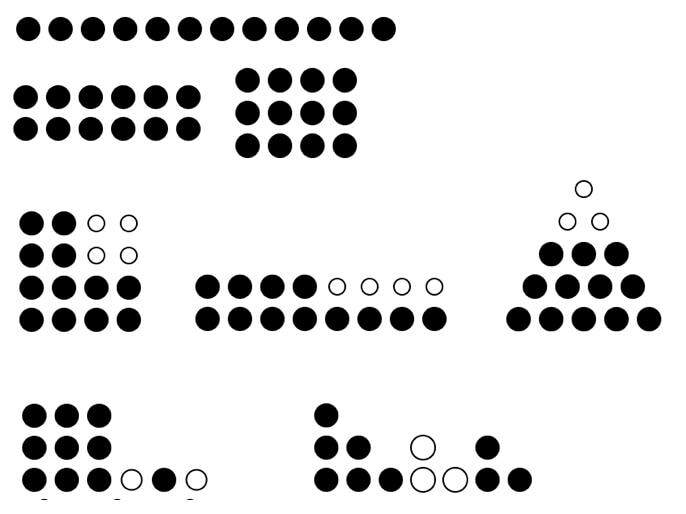 Also included are applets for counting in different bases, for displaying the GCD (HCF) and LCM of a pair of numbers, and for comparing the collection of all factor trees (as a single factor lattice) and paths within that lattice with the different ways of displaying "Lots of" for a given number. You have cards with symbols from some otherwise unknown language, showing 0, 1, 2 and 3. You have a collection of counters, and you need to inform someone who reads and understands only this other language, how many counters you have. ​The task is inspired by Zoltan Dienes, and refined by many people, including Tony Wing (UK) and Kieren Egan (Canada). ​Applet: Necklace Bases see applets in "Lots of"
Some numbers arise as the number of counters in a layer of regular polygons, either arising from a vertex or centred around a central point. two divisors of N re joined by an edge if and only if the larger divided by the smaller is a prime. The divisors fall naturally into layers, and the whole has an important structure. The lcm and gcd (hcf) of two divisors can be found in the lattice. 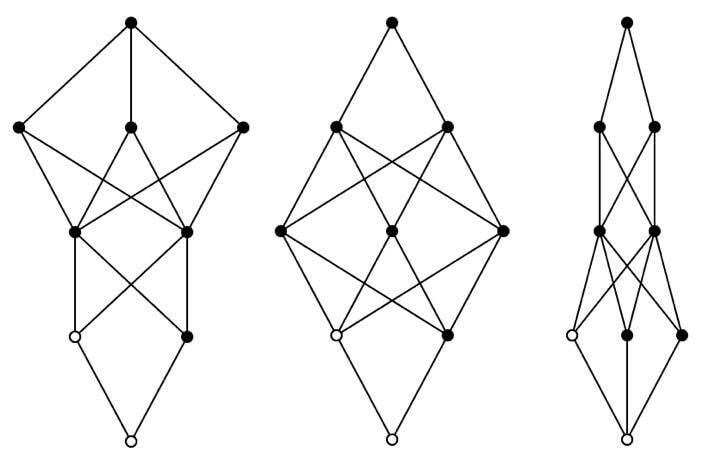 Indeed lattices are an abstraction of the property the each pair of divisors have an lcm and a gcd (hcf). 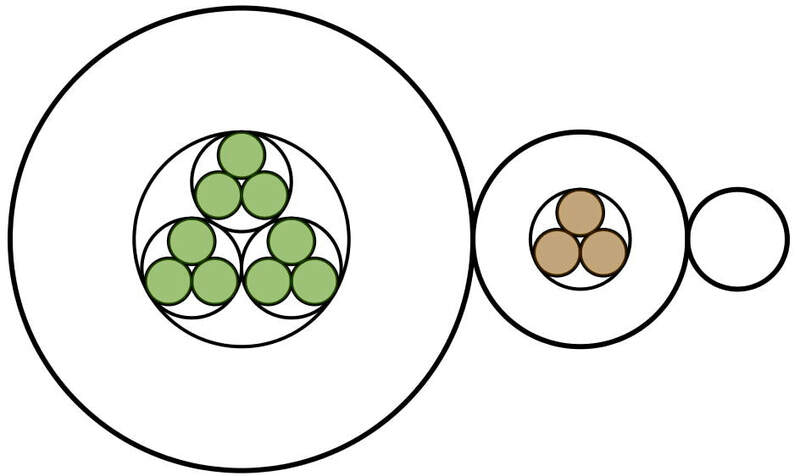 An important principle of counting arises in counting the number of threads from top to bottom in uniform diagrams like these corresponding to 12. There are connections with necklace diagrams. the Applet: Divisor Lattices provides the divisor lattice for. number, the various ways in which a thread count gives that number of threads, and a bipartite graph with the same number of edges.